Unlike our player rankings, the All-Lake Team isn’t based on college potential (though there are certainly potential college players on the list) but for their performance in the 2012 high school season. The big school team covers Division 1-4 teams. This is Tamminga’s fourth season as South Christian’s head coach, where he is 22-18. The Sailors were good if not spectacular in the regular season, 6-3, 4-1 for second place in the O-K Gold. But along the way Tamminga and his staff did a terrific job of introducing young talent to what was a solid core of upperclassman, regrouping from a 4-3 start to make the postseason. Their playoff roster looks a lot different than their season opening roster, and it’s not just underclassmen along for the joy ride, but key parts clicking like vets. And since one of those sophs is QB Jon Wassink, look for this to be the first of three seasons in which Tamminga has South Christian in state title contention. A unique player who combines power running with deliberate yet strong throwing. The result? Comstock Park has made playoff runs in all three years Brown has been under center, reaching the Division 4 semifinals this season. He’s completed 134-of-234 passes for 1,600 yards and 10 TDS to two interceptions; and run for 1,130 yards and 24 TDs. A punishing runner — he also starts at linebacker — who embodies the physical style of a Big Reds team that has earned a Division 2 state semifinals berth. King has run the ball 184 times for 1,474 yards and 17 TDs. Zeeland East was the only team to beat Muskegon, and Viening was the dominant athlete on the field in that one as both a runner and linebacker. He topped 1,000 rushing yards for the second-straight season, taking the ball 186 times for 1,337 yards and 20 TDs, while sharing the backfield with another 1,000-yard rusher, senior Josh Blauwkamp. He was committed to Central Michigan before the season began, and went on to show the potential of being yet another good Chippewa lineman as his pass blocking improves. Not just big but a bit mean and a hard worker, he and fellow senior tackle Riley Norman helped junior QB Jalen Brooks to run for 1,699 yards and 27 TDs. Tackle on the state’s best offensive line, where he’s helped the Big Reds’ veer average over 400 rushing yards per game. Billings didn’t allow a sack all season, and has 73 pancake blocks. Mesbergen got it going at guard for a Dux wing-T that no one was able to stop all year. If Zeeland West lost, it was just because the other team outscored them. They had three backs with at least 850 rushing yards and double-digit touchdowns, led by junior Marcus Lambert’s 1,659 yards and 16 TDs. Mesbergen also started at linebacker. There were five possible D1 offensive lineman in the Big North, but Hayes is the only one who doesn’t play a tackle. He’s a mauler who also has to mix it up and pass block for TC West. Hayes has offers from CMU, WMU, Pitt, Syracuse and Indiana. He was an all-conference center the past two seasons. He keyed the trap blocking that afforded Mattawan’s wing-T offense two 1,000-yard rushers, Trevor Sweeney and Brock Lamorandier. Klage is committed to Northern Michigan. So often with the Eastside recruiting hype machine, you get kids who are workout warriors or look nice in tight shirts and the Internet fanboys go gaga, only to find out that when the pads go on it’s a different story, dude can’t really play football. Often this happens too late — once they’d signed with a top 25 team. Harris is different, embodying his Westside roots with substance to justify the buzz. The Michigan State commitment earned his stock by dominating on the field of play. If GR Christian reaches the Division 3 state final, he will likely end up setting the state single-season receiving record. He’s caught 76 balls for 1,556 yards and 15 TDS — finding the end zone in all 12 of the Eagles’ games. The all-time receiving leader at Kenowa Hills by nearly 600 yards, Smith was the top offensive threat on a playoff team. He caught 64 passes for 1,237 yards and 13 TDs and also had two special teams TDs. EGR coach Peter Stuursma calls Cvengros one of the most versatile tight ends he’s had with the Pioneers. He caught 22 passes for 325 yards and four TDs. He was also an outstanding blocker, with Cvengros and another undersized but fast lineman, junior Troy Gotch, helping clear the way for senior Jahaan Brown to run for 1,612 yards and 15 TDs. Going into Grand Rapids Christian’s Division 3 semifinal game, Schipper has connected on 11-of-13 field goals, with a long of 48 yards. On PATs he’s a perfect 61-of-61. Of 82 kickoffs, 42 have been touch-backs. He’s narrowed his college choices to Michigan State and Western Michigan. From his D-end spot, Howe had 78 tackles, including 14 for loss with four sacks. He forced two fumbles. Howe is an all-around contributor, a three-year, two-way player, as well as the Huskies’ kicker and punter. Howe’s 42.3 yards per punt is a school record, as is his 67-yard punt. He rushed for eight TDs. He was already being recruited across the nation, and that attention should increase after last Saturday in Midland, where Finley and senior teammate Ronald Jenkins overwhelmed who Tom Lemming says may be the country’s No. 1 tackle prospect, Midland’s Steve Elmer. The scary thing for offensive linemen of the future is that Finley is still just learning how to play defensive tackle. Going into the Division 2 semifinals, Finley has 76 tackles and three recovered fumbles. He’s been a dominant two-way lineman for Comstock Park’s playoff teams.You know Mazur is good when he’s one of the rare players to have squarely leveled Catholic Central’s Ryheem Stokes. In his first season at Fruitport, Hendricks had a major impact on both sides of the ball as a defensive and offensive tackle for this playoff team. Hendricks collapsed lines, pressured QBs and had 60 tackles. He’s being recruited by U-M, MSU, WMU and Temple. As strong as Muskegon is up front, perhaps the purest football player in the unit is this junior linebacker. Hunt is fast and delivers a wallup. He’s the Big Reds’ leading tackler. The big hitter from a defense that held five opponents scoreless. 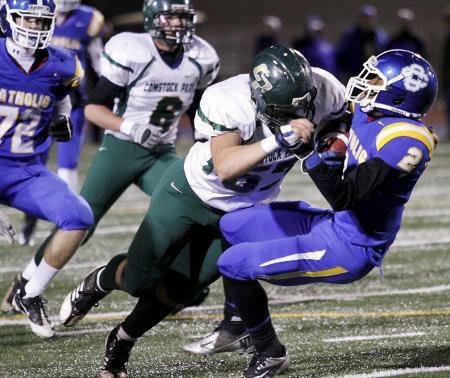 Craven had over 100 tackles and finishes up as Catholic Central’s career tackles leader. The veteran stalwart of a young defense that has improved to state championship form. Hall is the Eagles’ leading tacker for the second year in a row. Going into the Division 3 state semifinals, he has 130 tackles. The Rangers didn’t have enough players to field a JV team. With the energy Lamica plays with, he could’ve held down multiple positions for them on Thursday, and still starred on Friday in the Lake Michigan area’s toughest league — the O-K White. He covered the whole field with his big frame and 4.6 speed. Lamica was also Forest Hills Central’s leading receiver with 364 yards and three TDs. The most dynamic, exciting player in the Lake area whenever he got his hands on the ball. Line him up at any skill position and he becomes the dominant player on the field. Over the course of CC’s 10-1 season, Stokes had an 183-yard, three TD game receiving; a 181-yard, two TD game rushing; returned an interception 103 yards for a TD; returned a kickoff for a 75-yard TD; blocked a punt and returned it for a TD; ran for over 100 yards against Comstock Park’s loaded defense. Stokes finished the year with 1,400 all-purpose yards, four interceptions and 16 TDs. Versatile, impact player for one of the Lake’s best defenses. Hoogerhyde is big and tackles like a linebacker, but is athletic enough to be a cover guy. He had one of the top performances anyone has turned in all season in Caledonia’s regional win at Mattawan. Hoogerhyde spied All-Lake running back Trevor Sweeney holding him to his lowest output of the season, while himself rushing for 207 yards and two TDs. He finished the year with 112 tackles and nine interceptions, while totaling over 1,400 yards running and receiving from running back. He rarely left the field for West Ottawa, and was the most dangerous skill position player in the O-K Red. Verhelst made 41 tackles, caused two fumbles, broke up six passes and made five interceptions, two of which he brought all the way back for TDs. As a receiver he caught 39 passes for 630 yards and 13 TDs. He had an 85-yard punt return TD. Quinn Ameel Sr DB Petoskey; Isaac Andrusiak Sr WR Caledonia; Mitch Bancroft Sr DB Lakeshore; Patrick Banks Sr DL Zeeland East; Utah Bartholic Sr LB Grandville; Cal Beck Sr OL Paw Paw; Colin Beebe Jr LB Allendale; Riley Bell Jr DB Portage Northern; Brandon Benac Sr RB Ogemaw Heights; Cody Berkobien Sr RB Spring Lake; Johndries Betts-Retter Sr RB Reeths-Puffer; Josh Blauwkamp Sr RB Zeeland East; Chris Bradford Sr DB Mona Shores; Asantay Brown Jr DB Mona Shores; Correy Brown Sr RB Three Rivers; Demetrius Brown Sr LB Muskegon; Jahaan Brown Sr RB East Grand Rapids; Paul Brown Jr LB GR Union; Josh Buie Jr LB Reeths-Puffer; Jake Bull Sr DL Hudsonville; Josh Burdewyik Sr LB Unity Christian; Ethan Buresh Sr LB Hamilton; Jake Bush Jr RB Comstock Park; Zac Caldwell Sr TE Gull Lake; Brandan Campbell Sr LB Otsego; Treshawn Campbell Sr LB Loy-Norrix; Justin Chopp Sr QB Forest Hills Central; Josh Colegrove So DL Lowell; Tabias Coleman Sr LB Byron Center; Ato Condole Sr WR West Ottawa; Miguel Correa Sr OL West Ottawa; Zach Crouch Sr TE GR Christian; Nate Couturier So WR Allendale; Garrett Cross Sr RB Byron Center; Jake Daugherty Sr LB Big Rapids; Mason Dekker So LB West Ottawa; Derrick Diver Sr LB TC West; Zac Drake Jr RB Lakeshore; Dan Dyer Sr OL Lowell; Tanner Ellens Sr DL Caledonia; Tyler Fehler Sr QB Fruitport; Amilio Flores Sr DL Fruitport; Randy Garvin Jr LB Rockford; Tyler Gildersleeve Sr OL TC Central; Dakota Gordon Sr RB Fruitport; Stephen Hanson Jr OL Reeths-Puffer; Colt Harrington Sr DL Greenville; Dontel Highsmith Sr WR Dowagiac; Nate Hollern Sr LB GR Catholic Central; DJ Hunt Sr LB Dowagiac; Zach Huser Sr LB Lowell; Tyree Jackson So QB Mona Shores; DeJuan James Sr RB Portage Central; Gary Jones Sr RB Allegan; Jake Kaczyinski Jr DL Ludington; Brian Killinger Sr LB GR Northview; Malik King Jr OL Muskegon; Nick Kronemeyer Sr QB Hamilton; Justin Krueger Sr DB Caledonia; Louis Lamberti Sr K Petoskey; Austin Labus Jr DL/OL Portage Northern;Brock Lamorandier Sr RB Mattawan; Justin McCauley Sr QB Paw Paw; Collin McCaw Sr WR Vicksburg; Jason Miller Sr DB South Christian; Matt Mulcahy Sr OL Grand Haven; Isaak Newhouse Jr WR Grand Haven; Corey Pierce Sr DB Orchard View; Quinton Pully Sr LB Ottawa Hills; John Pung Sr RB Zeeland East; Chandar Ricks Sr OL Muskegon; Bishop Robinson Sr WR Loy-Norrix; Jack Rozema Sr QB Wyoming; Ryan Schaefer Sr DL Lowell; Collin Schlosser Sr LB Forest Hills Central; TJ Schepperly Sr QB TC Central; Cody Schneider Jr DB Mona Shores; Zack Schneider Sr WR Grandville; Stephen Shafer Jr RB Hastings; Kyle Short Sr QB Rockford; Brent Showers Jr LB Rockford; Sam Shutes Sr QB Three Rivers; Kyler Shurlow Jr DB Lowell; Preston Simon Jr LB Portage Northern; Jalen Smith Sr QB Muskegon; Marcus Smith Sr RB Muskegon; Trevor Steenwyk Jr OL South Christian; Chad Sterk Sr RB South Christian; Alec Stevens Jr OL Ogemaw Heights; Reed Stormzand Sr LB Lowell; Shomari Tate Sr DL GR Catholic Central; Alex VanDeVusse Sr QB GR Christian; Luke VanEssen Sr TE Kenowa Hills; Trevor VanTubbergen Sr QB West Ottawa; Adam Walma Sr DL Caledonia; Jon Wassink So QB South Christian; Chad Walton Sr WR GR Northview; John Weldon Sr LB Comstock Park; Tyler White Sr TE Plainwell; Harold Wiggins Sr WR Lakeshore; Mitchell Wynkoop Jr DL TC Central. Thanks for the comment. Hope to see him at the Senior Exposure Camp on December 2nd.